We all love to have Raffaello candy or Raffaello chocolate. But what about a pudding with this Raffaello flavor. Yes, that's what I have tried here. And thank god, it really came out very well. 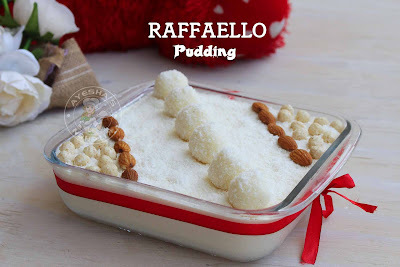 A few years back I have posted a similar recipe - raffaello pudding but this one tastes good as it is more creamy. 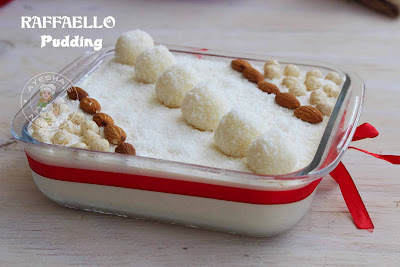 Though i have not used hazelnut or white chocolate for making this yummy creamy Raffaello pudding, it tastes amazingly delicious. Addition of white chocolate in this pudding recipe will surely make the difference but most of my viewers need simple and handy ingredients recipes. You can also top this pudding with some white chocolate shavings for making this pudding rich and crowd-pleasing. Here is the recipe showing how to make yummy party pudding or yummy creamy Raffaello pudding without fresh cream. Here i used a mixture of milk powder and milk instead of fresh cream which really makes this dessert so simple and special. So let's move on to the recipe of this simple dessert recipe. Prepare the whipped cream using whipping powder and milk. (here is the video link - how to make Whipped cream at home ). Set aside. Soak the china grass in half a cup of water and then cook over a slow flame until it dissolves to a clear liquid. When done, set aside to cool slightly. Do not combine the hot china grass mixture with the whipped cream. To the whipped cream mixture, add condensed milk and combine very well. Add the vanilla essence, milk powder and milk mixture (combine together 3 tsp of milk powder and 3 tsp of milk ) and combine very well. Add the prepared china grass liquid to this mixture and again combine well. Now, finally add the desiccated coconut and mix well. Keep refrigerated for 6 to 8 hours or overnight. 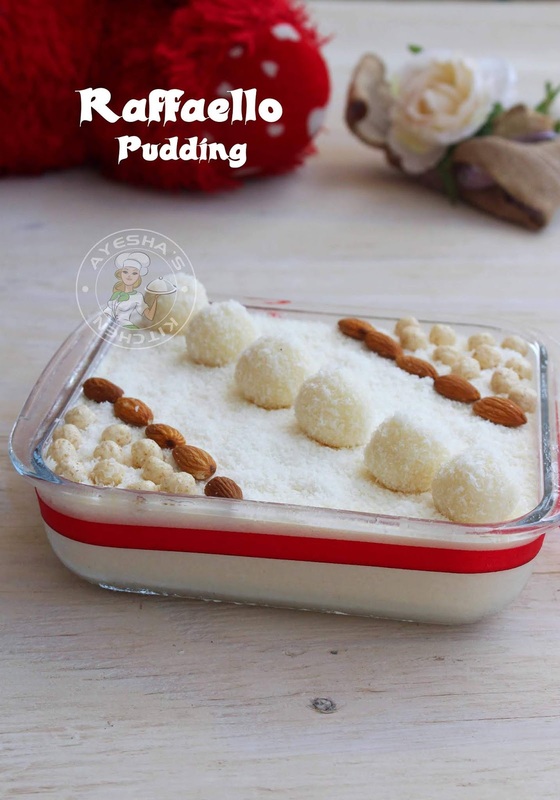 When done, decorate with Raffaello balls or coconut balls, almonds and desiccated coconut. An egg is a versatile ingredient which can be used in many dishes. It has many uses in the kitchen. We use eggs in baking, add it to snacks for binding, in desserts recipes, for giving a glaze, added to our main course meal like biryani and even we make spicy pickle using this versatile ingredient egg. 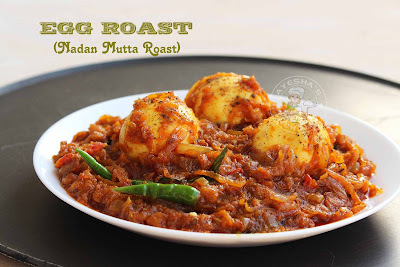 Here am with a very simple egg masala or egg roast which tastes perfect along with dosa and chapati. The best side dish for chapati and dosa, I must say that. You can make this roast in short time at home and is so simple and easy even for bachelors or starters in cooking. Weekends are always special for us and we do love to have simple but yummy breakfast especially on those days so that we can enjoy the whole day. And this is the easiest way to invigorate the weekend morning or breakfast. 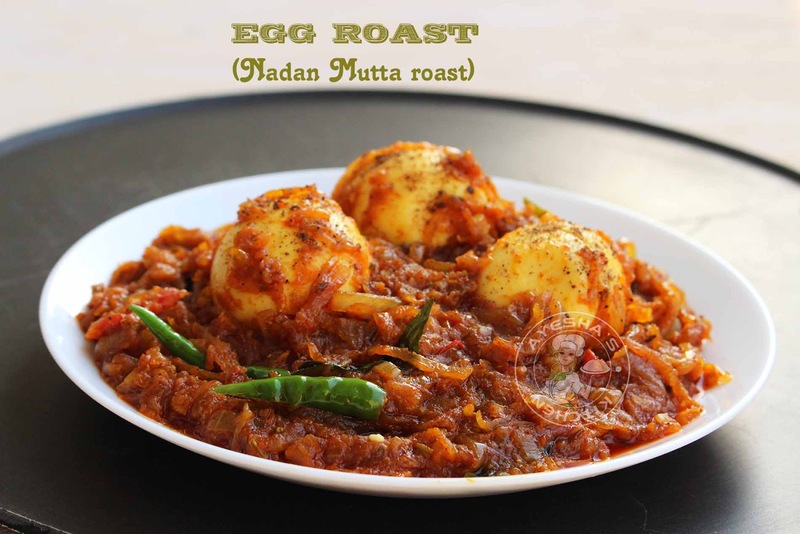 Here is the recipe showing how to make perfect egg roast or Kerala style nadan mutta roast. Heat coconut oil in a wok and saute the crushed mixture of ginger garlic and fennel seed. Saute for 2 minutes over a medium-low flame. Then add thinly sliced onion and mix well. Add salt and let it cook covered until it turns soft and slightly golden. The onion must be sauteed well before adding any other ingredients. Once the onion turns golden add green chilies, chili powder, turmeric powder and again salt. Mix well to combine. Then add 1 tsp of pepper powder and mix well. Now add the sliced tomato and cook covered until the tomato turns mushy. Add little water, 1 tsp of pepper powder, curry leaves and then the jaggery. Combine very well. Add the hard-boiled eggs and mix well. Cook covered until the oil floats on the top. So our delicious egg roast is ready to serve. It tastes perfect with chapati and dosa.